Yes, we know that June is over, but we had so much AWESOME that we couldn't fit it into one month. Plus, do we really want it to end? I couldn't let JIAM end without letting you know about this audiobook series. I ADORE this series on audiobook! The reader, Rebecca Lowman, was PERFECT for this narration. It's one of my absolute favorites ever, and I hope you get a chance to listen to these books! Thanks to Random House Audio, we're giving one of you a chance to get one right now! Winner's choice, either Nightshade, Wolfsbane, or Blood Rose (depending on where you are in the series). Make sure you check out the reader here! Free stuff is the best! I listened to Wolfsbane and Bloodrose on audio and I enjoyed them. I own the books but haven't read any of them.. Would be nice to hear them in an audio book. Oooh, I'd love to win the first book in this series. Thank you for being so generous and having one more giveaway. I'd like to hear the books. Thanks for the giveaway. Ack! I want these books! Since I can only choose one and haven't read the first one yet, I'd have to go with Nightshade. Thanks for the audio giveaway. I love audiobooks! I haven't read any of the books in this series, but everyone keeps saying how good they are. I really need to start reading them. Thank you for such a high recommendation of the audio I may have to try the series on audio. I love audiobooks to listen to while I'm driving. This sounds like a perfect fit for me. Thanks for offering it! I've heard all three books and really liked them. I would love to listen to them on audio! I haven't read this series yet, but everyone seems to love it! 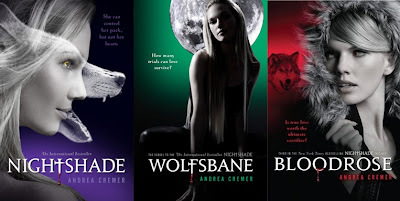 I loved Nightshade and Wolfsbane but have yet to read Bloodrose. Would love to listen to this on audiobook! I've been meaning to read the rest of this series, but I haven't gotten to it yet. I didn't know that the audiobooks were pretty good! I have to check it out. Audio books to me are like life's blood. I can't live without them! Thanks for the giveaway! I've been meaning to try this series. I'm still hoping to win an audio book for my cousin who has eye problems. I just want to her to give it a try!! I have read this series and it is great! example, the barclaycard simplicity card offers a low rate of 7.